Does your child spend a lot of time staring at computer screens, mobile devices, and electronic games? Ours too! Each day after school, Noah can hardly wait to get home to his computer (as he’s mobile gaming in the back seat). But we also encourage him to do outdoor activities. For example, he likes to go camping, fishing, and hunting. 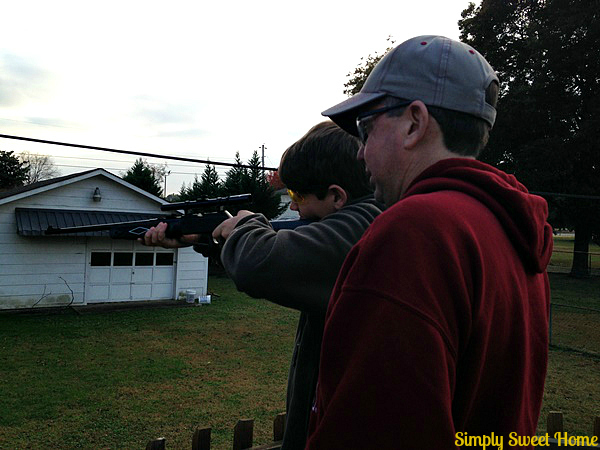 And while we can’t exactly do these activities every day, going out to do some target shooting is quite do-able. 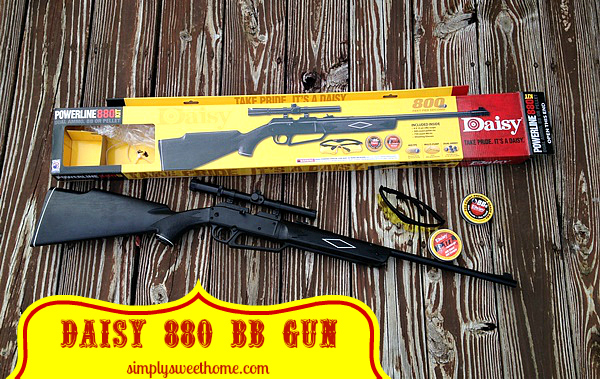 For this reason, we got Noah an early Christmas present: the Daisy 880 BB Gun. Noah is 14, so this is a very good gun for his age group. If you want your child to spend more time outdoors too, you can encourage them and teach them about hunting or camping. Daisy has a lot of great Christmas gifts for boys and girls. Another great thing about this present is that it gives the boys an excuse to do something outside together, which is always a plus! 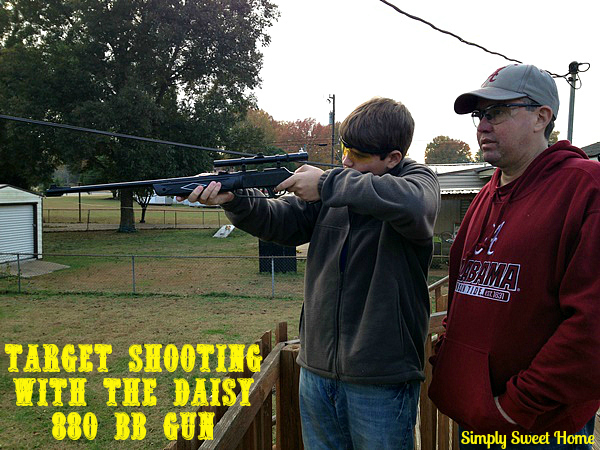 Daisy educates roughly one million of America’s youth a year through their Ten Lesson Shooting Curriculum about BB gun use and safety (found here). They educate through their partnership with leading conservation and youth training organizations such as National Wild Turkey’s JAKES Take Aim, 4-H National Shooting Sports, Rocky Mountain Elk Foundation, Royal Rangers, Youth Shooting Sports Alliance, Civilian Marksmanship, NRA, JROTC units, scouting, fish and game as well as church and private camps. 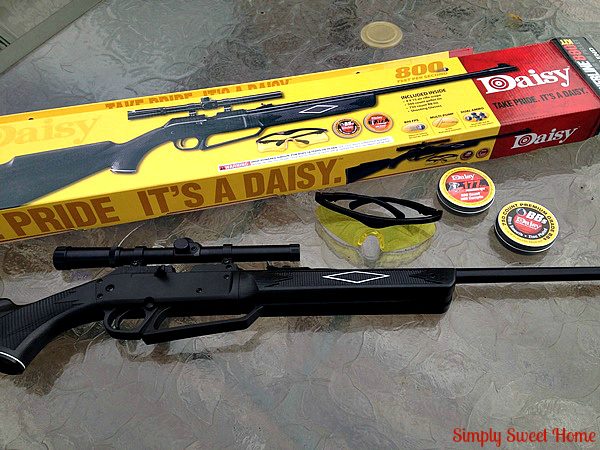 If you’re thinking of getting your child his/her first Daisy BB, I’ve also got an activity and printables to help you teach your kids gun safety and practice their shooting while they learn. The activity is very simple: Set up your target, and put on safety glasses. 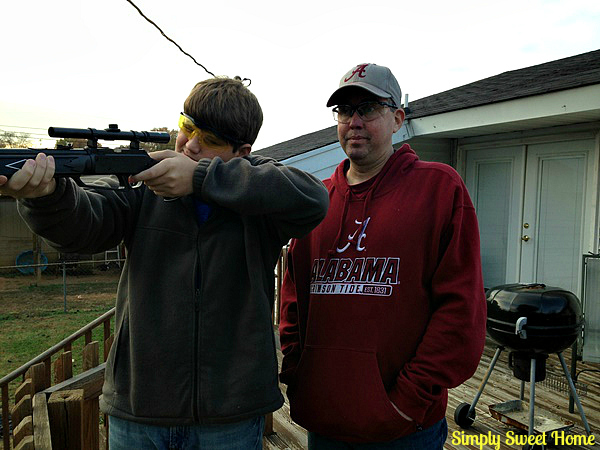 If this is your child’s first time shooting, explain the gun’s parts and how it works. Load your gun. Read safety tip number one aloud with your child. Explain the tip and answer questions as needed. Instruct your child to shoot at the target. (Assist them if needed.) Move on to the next tip and repeat until you’ve gone over each tip. 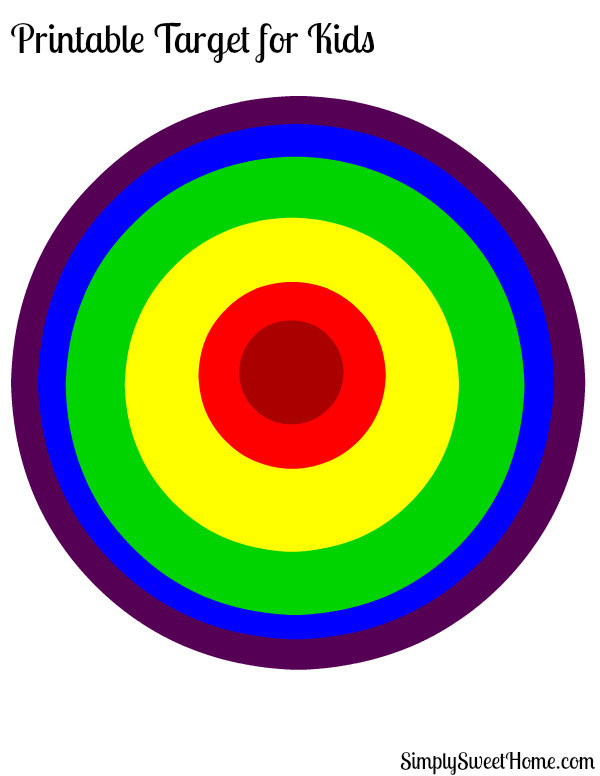 Do more target shooting if you wish. After your finished shooting, go over all the tips again and/or ask your child what they learned. To make the activity even more fun, you could even award your child points for shooting and learning each tip, which also makes for a great game if you have more than one child. 1. Guns are not toys. 2. Always wear safety goggles or glasses when shooting. 3. Always handle your gun as if it is loaded, even if it is not. 4. Don’t point your gun at another person or yourself. 5. Don’t run with your gun. 6. Never handle your gun without a grown up present, and never hunt alone. 7. When not shooting always have the safety on. 8. When walking with your gun, have your safety on and keep the muzzle pointed down. 9. Never cross a fence while holding your gun. 10. If you see someone with a gun, tell a grown up. And of course, you must have a target for the actual shooting part of the activity. 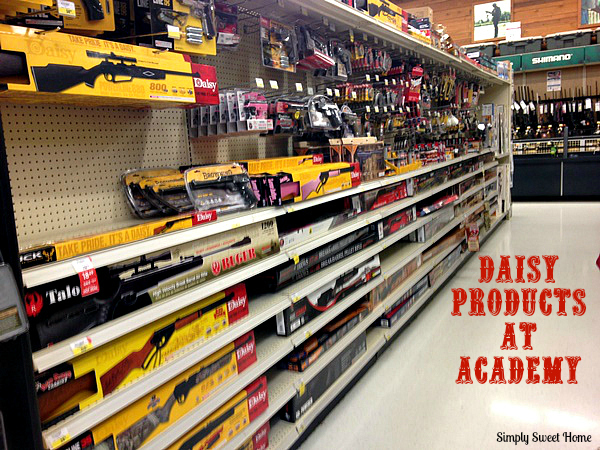 There are a lot of targets you can purchase at Academy, or you may print some out online. I made a cute rainbow target the other day that I think kids will enjoy! 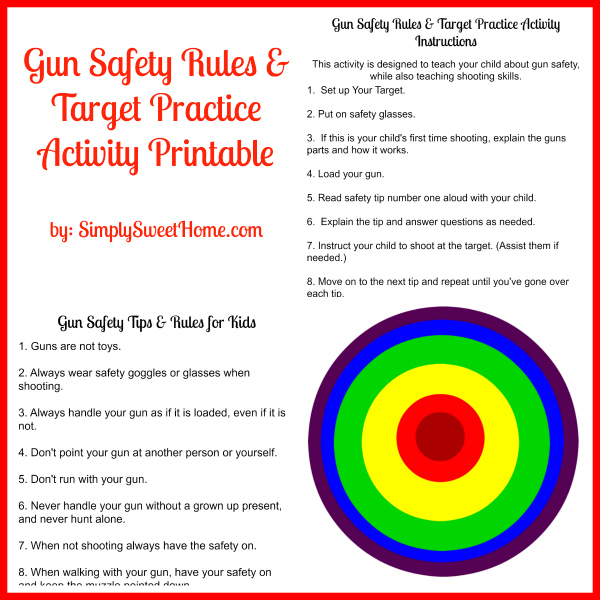 Download the Printable Activity Instructions, Safety Tips, and Shooting Target Here. Connect with Daisy: Check out the Daisy 880 and other great gift items on the Daisy Website, and look up deals and product updates at Daisy Outdoor On Facebook and @DaisyOutdoor on Twitter. Giveaway! 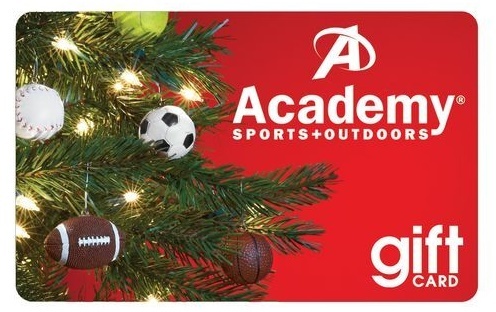 One Simply Sweet Home reader will win a $100 Academy Gift Card, so that you can go out and buy your child his/her very own Daisy BB Gun. I would give it to my nephew! My son just turned nine, so this would be for him. I would like to give a Daisy to my younger nephew this holiday season, he would love it! My son would love this! We have 20 acres of land and he would love a blast! I would give this to my cousin! I’d love to give this to my son for Christmas! I would gift this to my oldest grandson! I would give a Daisy to my nephew this holiday season. I would give it to my oldest granddaughter. I like that it is available in pink. I’d like to give one to my older son. I would gift a Daisy to each of my older girls. I would give a Daisy to my son.